Hi Friends: There is a new challenge today over at the Stinkin' Inkers Challenges Blog, where the current theme is Girls Just Want To Have Fun. Stamp image onto smooth white cardstock with black ink and color with Spectrum Noir markers. Cut image with circle die cut and ink edges. Cut card base with Circle flip die. Cut patterned paper side panels with matching dies, ink edges, and glue to card. Cut larger circle from orange cardstock and adhere to circle flip, then add focal image. Cut Sweet Friend sentiment from orange cardstock and glue to inside of circle flip. 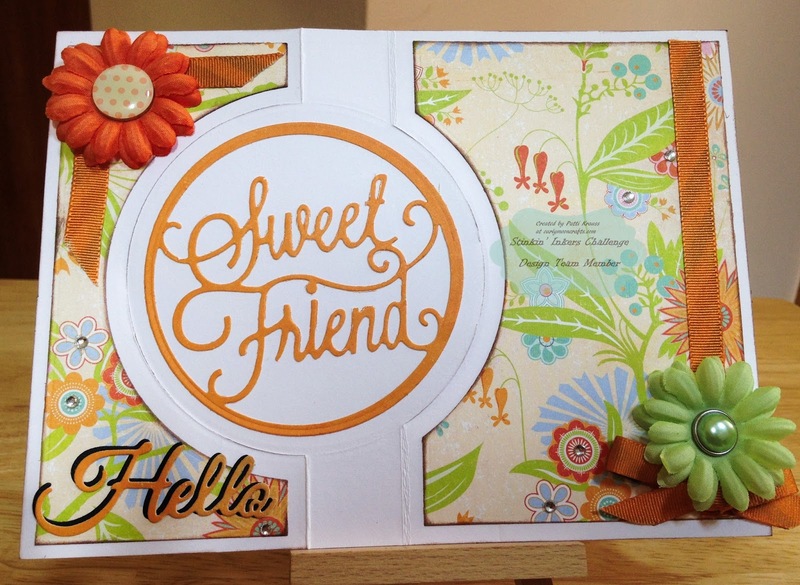 Cut Hello sentiment from both orange and black cardstock; layer the sentiments and glue to bottom front panel. Add ribbon and bow to card as shown, then add flowers with brad centers on top of ribbon. Finish with a scattering of gems.